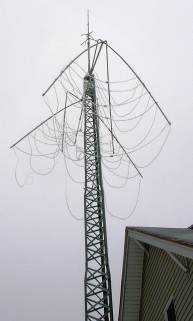 In early December, 2005 I learned that Lightning Bolt Antennas has gone out of business after 17 years. So, the purpose of sharing this information has become somewhat moot. 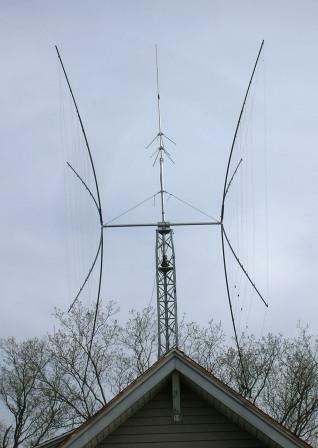 However, most of what is great about the Lightning Bolt Quad applies to just about any well built quad antenna. If you are interested in a quad, check out the Cubex Quad website. 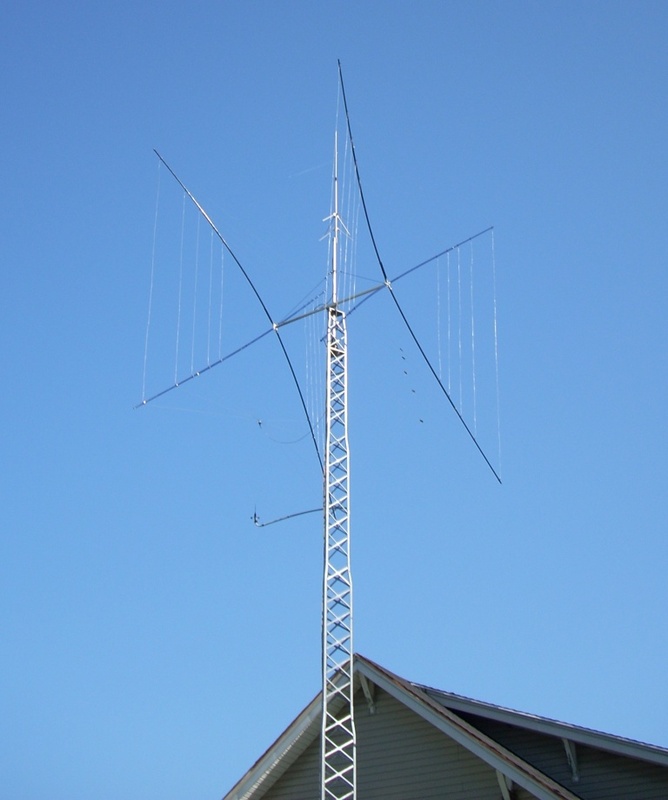 They have lots of info on quads and they also make fine antennas. 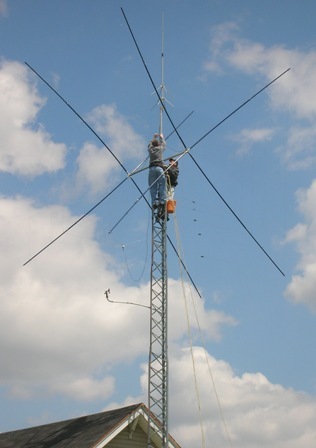 This antenna was installed 8-14-05. Assembly and installation went very well. Good SWR across all bands. Performance is awesome. Made it through a number of storms and the first winter with no trouble. During 70 mph winds it really appears very stable. 4 - Short 8 ft. boom = easy on rotor. 6 - Very low noise RX (compared to my vertical). 8 - Very good F/B and F/S ratio. 3 - Uneven cuts on spreader arms & connector blocks. From stateside QSOs I have received great signal reports - often 10 to 20 over S9. S3 and S4 received signals on my Butternut vertical jump to S9 and above with the Quad pointed properly. 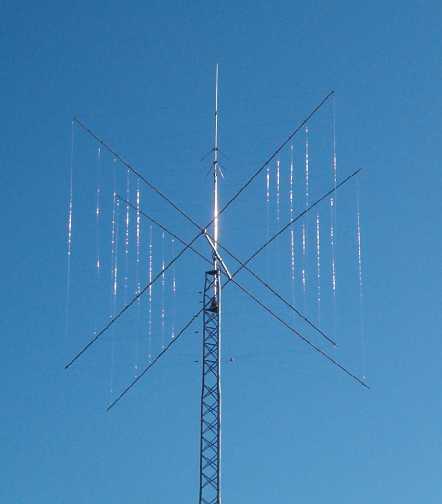 Lite signals on the Quad often disappear on the Butternut. On December 19, 2008 Northern Indiana suffered the worst ice storm that can be remembered. With temperatures hovering right at freezing and heavy fog and mist, ice built up on the quad until the fiberglass top spreaders on both elements finally snapped. Unlike some other Lightningbolt quad owners, the boom did not break. 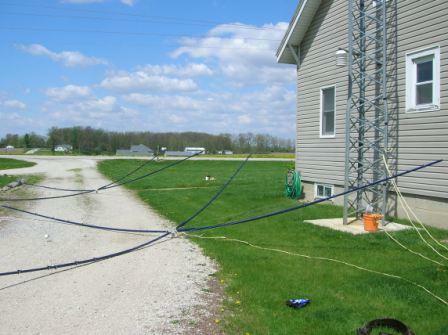 As can be seen in the pictures, this creates a mess of tangled wire. Since this happened in early winter, I was pretty much stuck until Spring to begin repairs - waiting for warm weather. As soon as possible, we brought down the broken spreader assemblies. I had been having some rotor issues for a while so we also brought the Alliance HD-73 rotor down to see what the problem was. The four top spreaders all snapped near the spreader hub. The Alliance rotor had a cracked housing internally so it was replaced with a new Yaesu G-800SA. I don't believe that this had anything to do with the ice storm, rather just age. After deciding to repair the quad, I found that Max-Gain Systems could provide replacement spreaders. These spreaders proved to be much thicker, stronger, and heavier than the spreaders that came with the Lightningbolt Quads. 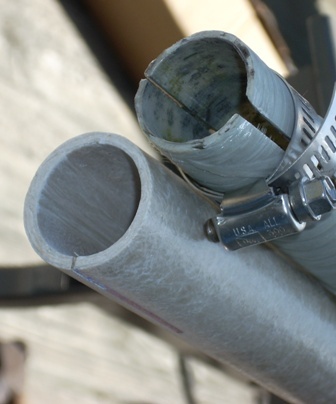 Max-Gain Systems recommended strengthening the spreader near the base by inserting the 24 inch cutoff piece of the smaller diameter pole and gluing it into the base of the larger pole. They also recommended a UV protective paint for added protection. This image shows the thicker fiberglass of the Max-Gain spreader This image shows the cutoff piece of the smaller fiberglass being inserted into the base of the larger spreader. 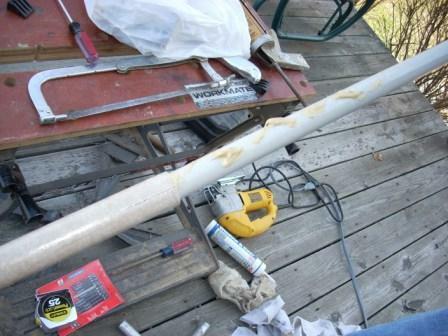 Liquid Nails exterior glue is used. 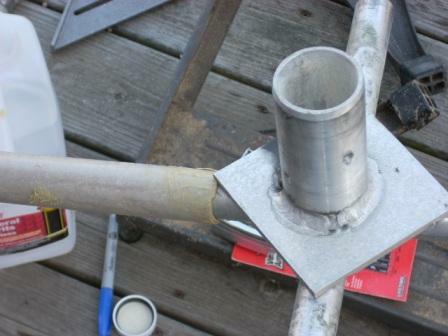 The spreader hub is used to push the insert in far enough. Here, both elements have been re-inserted into the boom. The boom has been centered and now we are installing the new boom truss. Looks a little better than the tangled mess after the ice storm! In this photo you can see the boom truss that will help carry the extra weight of the heavier elements and protect the boom in future ice storms. 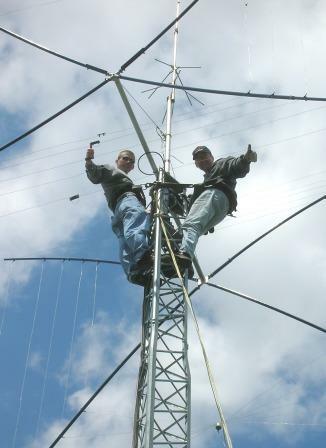 The 2 vertical bolts that pin the elements into the boom were replaced with eye-bolts and a saddle-clamp and 2 turnbuckles were mounted on the extended mast. 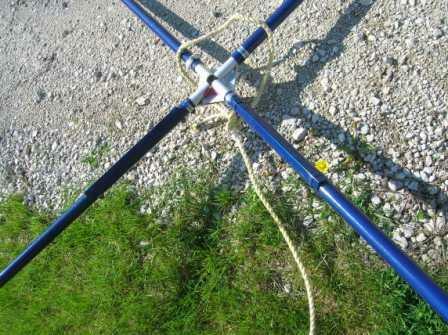 Dacron antenna rope is used for the truss cable. I am on the right and my son, Chris-KC9JMK, is on the left. All the work is done. Thanks to XYL Carol for ground support and photos. My intentions were to document the assembly of the Lightning Bolt Quad completely since the Lightning Bolt Antennas website is a little skimpy in that area. However, I ran across the website of Dan - W3DF and he has done an awesome job of documenting the procedure. No need to re-invent the wheel so here is the link to Dan's very fine website : Dan - W3DF Be sure to check out the rest of Dan's very nice site!